Irish sites two weeks in a row? Tá Éire uamhnach! This post provides a look at what an Irish professional group does to support its members’ careers, and I’m so pleased to be able to share it with you. Keeping reading to learn more about The Library Association of Ireland’s Career Development Group. The Career Development Section of the Library Association of Ireland represents both existing library and information professionals and new graduates looking for job opportunities. The function of the CDG is to develop a proactive approach to employment in libraries through the discussion of issues such as career development, CV and interview tips, alternative funding models for job creation, non-traditional work opportunities. This will be done through formal events, informal events such as Library Camp Ireland 2013, talks and joint training with other LAI committees/groups. The LAICDG was initially developed by our previous chair, Giada Gelli. After many, many months of meetings with interested parties we began, in 2012, to develop a definite vision of the aims of our group. The primary reason for the development of the CDG was due to there not being a similar group in existence in Ireland. Given the current economic climate, we believe that it is necessary and essential to have a group like ours to help those who currently find themselves without employment in the information professional field. The members of the LAICDG have many diverse experiences. Some of us have worked as JobBridge interns, others have been unemployed and some are working in paid positions as information professionals. One thing we all have in common, however, is that we have a Master’s in Library and Information Studies. We represent new and existing library and information professionals in Ireland and we aim to help those who are currently seeking employment opportunities as well as those currently studying for a library degree or MLIS. Our main mode of communication is Twitter where we will announce any training or events. We also tweet items of interest relating to job search, the different aspects of librarianship and career development in general. For library job listings in Ireland we recommend www.libraryjobs.ie. The best way to use our site is to consult it as needed. Our blog contains details of our own events as well as others that our members have attended. We also have a page on the blog with links to career and job search resources. We encourage anyone with an interest in career development in libraries to make a submission to the CDG blog. Not yet! Our main impact comes through events so hopefully we’ll have some stories for you soon! We have just recently organised a very successful and well-received unconference in the Chocolate Factory recently and we are hoping to organise more career development events in the forthcoming months. 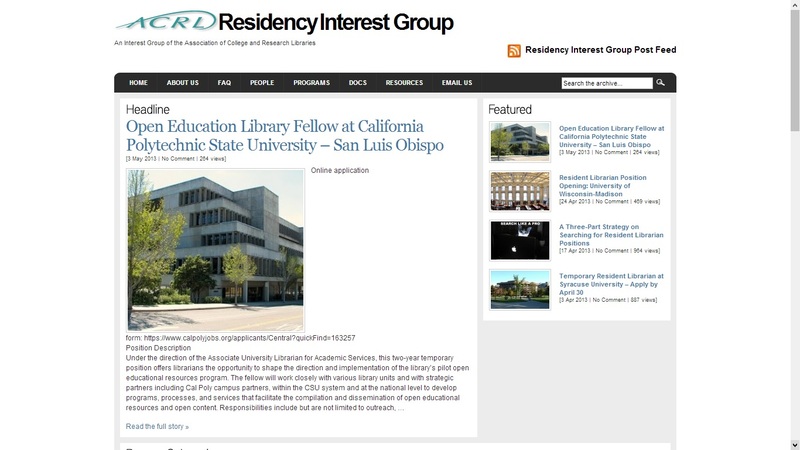 Today I’m happy to present a site from across the ocean, Library Jobs.ie. Margaret Irons runs a wonderful job posting site that gathers Irish library jobs of all kinds into one convenient location. She was also kind enough to do this interview whilst on maternity leave! Thanks, Margaret! We aim to consolidate the search for library jobs in Ireland. No more trawling through individual sites – we will do that for you. LibraryJobs.ie had been on my mind for years. I even bought a domain name many years ago but it just never got off the ground. Ireland is a small country but there was never any one place to find work in libraries. There are many job sites for librarians in the UK but no dedicated site in Ireland. The advertising of library jobs was and is very erratic. Also any generic jobs sites in Ireland generally don’t have library related roles listed in the drop down menu. And with the downturn in the economy the advertising of jobs in print media seemed to just stop altogether. So it seemed that the job search for graduates was just getting more and more difficult. Over the years, my friend Barry Gildea and I had many conversations about it. After he had successfully gotten Dublin Startup Jobs up and running, it looked like it was time to get serious about LibraryJobs.ie. Barry is a fantastic web designer and a college friend (He can be contacted at his website, Brickisred Design). It seemed like an obvious step to collaborate on this project after years of discussing it. So last summer we got around to it and LibraryJobs.ie was softly launched. It is run by myself (Margaret Irons) with design and technical input from Barry Gildea. As I am on maternity leave at the moment, my friend and colleague Ann O’Sullivan is currently updating the site with me. Ann has been a huge help. We have worked together for six years on the Academic & Special Libraries Section committee of the Library Association of Ireland and share a similar work ethic. So I knew the site would be safe in her hands. I am currently working as librarian in the School of Celtic Studies, Dublin Institute for Advanced Studies. My undergraduate degree is in History and Media & Communications. I have worked mainly in academic libraries from medical to third level and specialist research libraries. I qualified as a librarian in 2001 and since then I have been both an interviewee and interviewer, and an employee and employer. I also have had recent graduates and interns working with me and felt that many graduates were at a loss as to where to even begin searching for work. You can find out more about my career history on my LinkedIn Profile. LIS graduates or anyone looking for a library related job. We add internships for those who would like to gain experience in order to break into the market. Also we are trying to ‘think outside the box’ when it comes to roles that we advertise. It’s time to look beyond the ‘traditional’ library role. We use blogging software so updates can be followed like any blog. Also you can like us on Facebook or follow us on Twitter @LibraryJobs. We are also on LinkedIn and Google+. There really is no way you can miss out. No – it is a free service. “I think this is the toughest economic climate I can ever remember experiencing. The keys to helping land this role were perseverance, networking and using LibraryJobs.ie as my primary source for new opportunities. Keep a close eye on LibraryJobs.ie of course! Network, network, network. The library community is a very friendly and welcoming place. Go to events and mingle and get to know others. You will get a clearer vision of what is happening in the library world and may also even hear of a job that hasn’t yet made it on to LibraryJobs.ie.